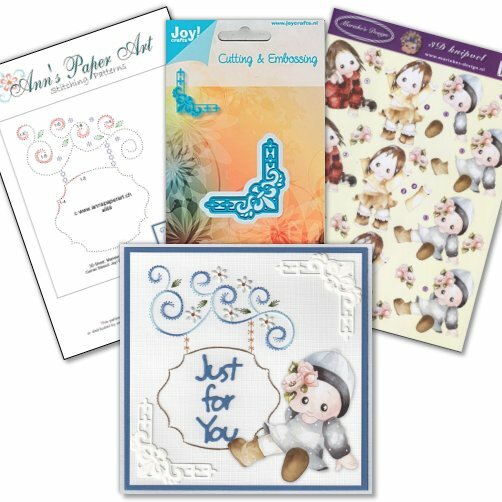 The theme is to use a stitching pattern by Ann's Paper Art on your project. You can also visit Ann's Paper Art Catalogue for inspiration. The winner will win the fantastic collection shown above. This post will stay at the top of my blog until the Challenge is complete. Ann has started the New Year with 3 beautiful new patterns for January. The pattern I have stitched is a671 and is available from the webshop now. The threads used are Mettler Polysheen, 1755, 6043, 741. The decoupage is by Marieke Design 2377 and she fits perfectly in the pattern. 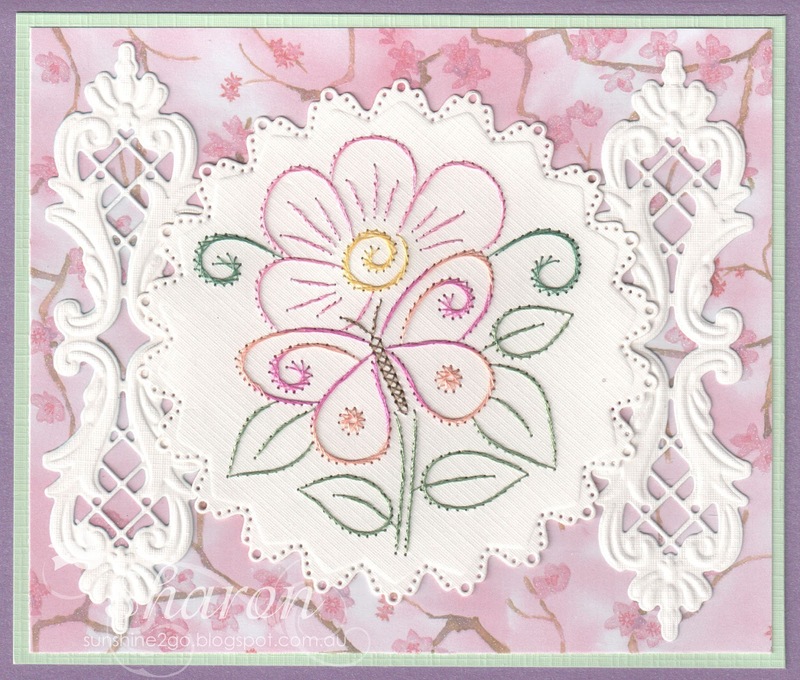 I decided to add little flowers using the Nellie Snellen Shape die SD004, which have been slightly coloured with Colourbox Fluid Chalk. Light green Hobbydots have been placed in the centre. The corners have been punched and a pearl added. 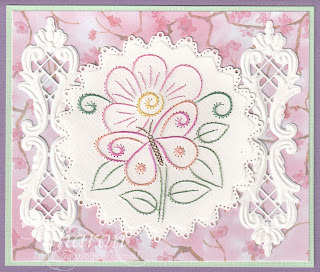 I have created this card for the blog Challenge at Creaine scrap en borduurblog. 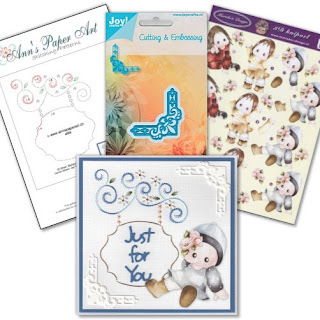 The pattern stitched is a718 and is available from Ann's Paper Art. Threads used are Mettler Polysheen 2550, 2732, 630, 1351, 853, 5822, 5542. 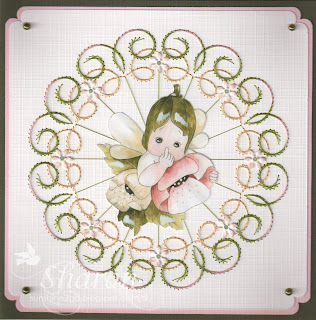 The pattern has been stitched onto a Spellbinders die, S4-348, Exquisitie Circles. Joy! Crafts 600/0149 have been used along the sides. The background paper is Papermania , "Lucy Cronwell". I made this card for a lady by the name of Sue (Buttons) from Ann's Paper Art Forum it was her birthday. Threads used are Mettler polysheen 5542, 3040, 3641, 3951. A Lili of the Valley Master piece has been die cut with Nellie Snellen MDF038 and placed in the centre. I added some fine glitter to the image. I die cut some flowers using the smallest die by Nellie Snellen SD004 and placed amongst the stitching, in the centre of the flowers I have used Hobbydots. Around the corners I have used the Cheery Lynn die Lace Corner Decor J-B 175.